Amanda Porterfield is an award winning journalist who has covered four states throughout her 10 year career. Porterfield started 2005 – beginning in Indiana as an intern at WNDU while completing her bachelor’s degree at Saint Mary’s College in Notre Dame, IN. From there, she moved up to production assistant and eventually started reporting for the weekend newscasts. Then it was at the ABC affiliate in Chattanooga,TN between 2008-2012 where Porterfield did it all. Alone, she uncovered, gathered video and interviews, wrote and presented stories on a variety of shifts. Porterfield also learned other newsroom roles such as producing, editing and running the assignment desk. 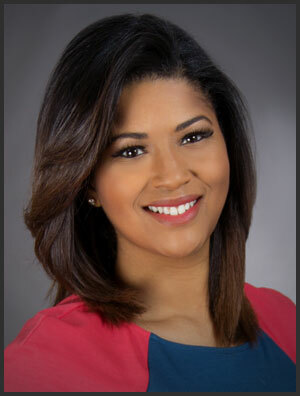 Using a variety of skills Porterfield excelled as an anchor and reporter at Champaign’s flagship station WCIA from 2012 until 2016. While there – she developed a strong following with a franchise called “Hometown Heroes” which featured stories of veterans across Central Illinois. Ultimately Porterfield worked with local businesses to encourage the community to help Honor Guard members fund their appearances at military funerals. With her stories, energy and organizational assistance “Operation Honor Guard’s live donation drive persuaded viewers to reach into their pockets ultimately raised a total of more than $90,000 dollars. However, another of Amanda Porterfield’s passions is investigative journalism, and expanding on stories that highlight social issues in the community. The Illinois Broadcaster’s Association awarded Porterfield with “Best Hard News Story” for her coverage of a woman addicted to heroin and her attempt to get help. The NAACP honored Porterfield with the “Social Justice” award for her unbiased reporting about social justice issues and honoring a culture of diversity in the community. She also worked closely with the Champaign County Sheriff’s Office on creating more opportunities for those with mental and behavioral issues. She continues to serve as a Champaign County Crimestoppers Board and the Champaign Park District Foundation Board. Thankfully, that passion led her to a place much of her family still calls home; Milwaukee as an anchor and reporter for CBS58. Born and raised in both MKE and Chicago, Porterfield is happy to be back in the heart of the Midwest. She’s back to enjoying life in a bigger city, and plans to get involved in issues and work on stories that matter to all people in Wisconsin alongside the dedicated news team here at CBS 58. But, if you see her hanging out at the park with her son, eating at a local restaurant or walking her dog Dusty, don’t hesitate to say hello! You can also find Amanda Porterfield on Facebook and on Twitter by following @CBS58AMANDA. We encourage you to email Amanda Porterfield’s work account with news tips and questions at aporterfield@cbs58.com. Filmmakers prepare to explore "Black Girl Training"
Wisconsin woman named among Essence Magazine's "100 Woke Women"